More competition for Apple in the photo book arena, but can Blurb hack it against iPhoto’s Books? A wide variety of page layouts are on offer, from full bleed to any combination of photos on a page that you can think of. Typical of the web 2.0 generation, Blurb is one of those nebulous entities that is a service, but also a company, a program, a website, a community, a blog and a bookshop. Confused? Don't be. Put simply, Blurb is a way of creating, uploading and then ordering your own photo books. Once ordered they get posted to you as real, physical books, just like the photo book service that's built into iPhoto. Your first step with Blurb is to register on the site then download its BookSmart program, which is free. The program is simple enough for anybody to use, if a little pernickety at times. You choose a size, type and theme for your book, then drag in your photos from either a folder, or from your iPhoto gallery, and experiment with different page layouts and add some captions. Once you're happy with the results you can preview the book, then upload it to the Blurb website, from which copies can be ordered. As with iPhoto, you can choose either a hard or soft cover for your book, but while Apple only offers books up to 11x8.5-inches, which start at £20, Blurb goes up to a whopping 13x11-inches for a photo book and its prices are more competitive. A comparable 8x10-inch book from Blurb starts at £9.95. For a 20-page hardcover 13x11-inch photo book (the largest size on offer) we were quoted £27.95. Add to that shipping to the UK of £3.88 (Economy), £4.41 (Priority) or £12.23 (Express). If you order over ten books, a 10% discount kicks in. You can also, of course, create smaller 7x7-inch, 10x8-inch and 8x10-inch books (in hard or soft cover) that are much cheaper. One of the attractions of Blurb is that once you've uploaded your book to the Blurb website you can send the link to other people, and they can order your book as well, or you can add it to the Blurb bookstore. You can even increase the price of your book to whatever you like, so that you can sell them at a profit! We don't need convincing about the concept of photo books – they're a great idea for preserving your precious memories. For things like a baby's first year, a souvenir of your honeymoon or as a cheap wedding album they're ideal. The real question with Blurb is how it compares to Apple's iPhoto. Blurb is cross-platform, and Windows users will need no convincing of BookSmart's charms, since they have little to compare it to, but Mac users will already be familiar with iPhoto's built-in photo book ordering service, and Blurb is going to have to offer something a little different to win them over. Unfortunately, BookSmart can't compete with the gorgeous themes that Apple has provided for iPhoto's books, and BookSmart's themes can look a bit basic in comparison. 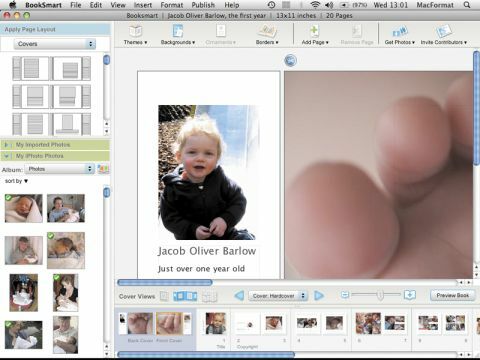 Working with your book, adding photos and moving things around also just feels easier and more natural in iPhoto. Both programs have easy drag-and-drop interfaces for creating books and link to your iPhoto library without a problem, but iPhoto is just more intuitive to use, suggesting different page layouts based on the size and orientation of your photos. Where BookSmart does better is, ironically, with books that contain mainly text, interspersed with photos, which is an option that iPhoto doesn't offer. If you've written a novel then Blurb can help you self-publish it to the world. Don't get us wrong. We like Blurb; its printing quality and prices are good, and it has superior options for working on books with other authors and selling them on Blurb's own bookstore. But when it comes down to it, for us it's just not going to replace iPhoto for producing photo books any time soon.